Through two periods, the Avalanche were neck-and-neck with Vegas. The third period was a different story. 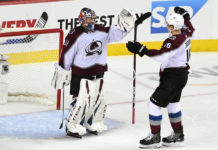 An early third-period letdown allowed the Vegas Golden Knights to get a two-goal lead on the Avs, and they never looked back, adding an empty netter to take the game 4-1. The Golden Knights outshot the Avs 14-4 in the third period after getting outshot 25-15 after two. The loss puts the Avs in a tough position in the playoff race, as a St. Louis victory tomorrow would put Colorado on the outside looking in. The first 20 minutes of the game were relatively even. The two teams traded shots back and forth, but neither team gave much of an inch in terms of high danger chances. The Avalanche only gave up three shots at even strength but were unable to get anything past Marc Andre Fleury. The game would take a turn in the second period. 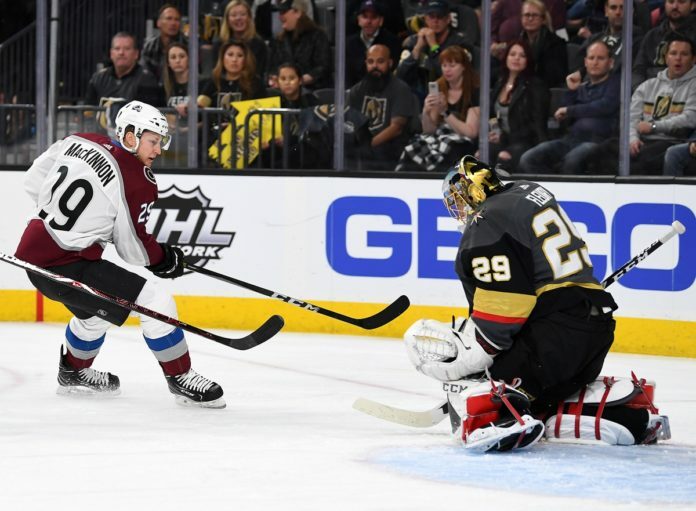 A bizarre too many men on the ice penalty by the Avalanche allowed the Golden Knights to draw first blood, as just eight seconds into the power play, Alex Tuch would find a rebound in his feet to beat Semyon Varlamov. The Knights held that lead for about 10 minutes before Erik Johnson jumped into the rush and buried a Blake Comeau rebound to tie it up. The goal would be controversial, as it looked like Comeau bumped into Fleury, but after a review, the goal would stand. The tie, however, would not last long. Immediately off the next faceoff, Tyson Jost took a high sticking double minor penalty and put the Avs shorthanded again. Just thirty seconds into the power play, Jonathan Marchessault would take the room given to him and beat Varlamov high glove, a shot similar to the one he beat Varlamov on Saturday afternoon. That gave the Knights the lead heading into the third, but the Avs would continue to push up until the end of the second period. The Avs came out flat in the third period, and the Knights took advantage. After numerous big saves by Varlamov in the first minute of the period, Shea Theodore would join the rush for the Knights and beat Varlamov glove side to extend the lead to two. From there, the Avalanche looked flustered and didn’t generate much of anything in terms of dangerous chances, despite having a power play halfway through the period. William Karlsson buried his 40th goal of the year into the empty net and that was all she wrote for the Avs. Colorado now has to wait and see how the Blues perform in their next game. A win for the Blues means the Avs no longer control their own destiny. The team has a chance to bounce back on Wednesday evening when they take on the Philadelphia Flyers in Denver. The game starts at 8 PM MST. 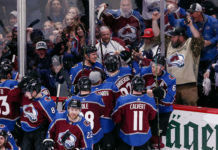 The Avalanche would once again dress 11 forwards and 7 defensemen, and the top line looked exhausted in the third period. All three of them would play between 23-24 minutes, which is high for an NHL forward. Anton Lindholm dressed for the first time in several games, but would barely play, not even eclipsing the 6 minute mark. Tyson Jost, who looked to be heating up at one point, now only has 2 goals in his last 17 games. 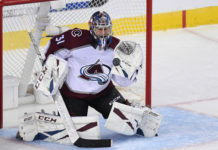 Semyon Varlamov was the best player on the ice for the Avs and was forced to make several great saves in the third to give the Avs a chance to battle back. After controlling the majority of the shot attempts through two periods, Vegas dominated the Avs in the third, attempting 25 shots while only allowing the Avs 6 attempts.